From the Earth to the Moon in a blaze of glory: Part 4a of our Vekoma history. In 1993 and concluding in 1995, Vekoma was one of the partner in one of Walt Disney Imagineering (WDI) largest project. Originally known as “Discovery Mountain” and built at Disneyland Paris (Chessy, France), Vekoma provided a MK-1200 Looping Coaster layout that was customized to fit inside a 200 feet wide dome that goes underground as well. The height of the coaster track is 105 feet tall and that is reached at the top of the launch catapult. The name was changed shortly before opening to Space Mountain: De la Terre a la Lune. But wait! The original project was much larger in scope and would have been housed in a 328 feet wide dome that would have also housed a restaurant, train station, walkways and a freefall attraction (A First Generation Freefall from Intamin/Giovanola). But, the project was revised and the planned walkway between the nearby Videopolis restaurant/theater and the mountain was cut and the current 200 feet dome was built. WDI and Vekoma had a major challenge with this installation, as they had to fit transfer tracks for 4 trains and 3281 feet of track among walkways, a maintenance area and an employee break room inside the dome. Originally, WDI sourced the trains themselves and they ran from 1995 to 2000. That year, due to the ride rather strong forces and extensive use, Disneyland Paris had new car chassis designed and built by Vekoma and when one of the ride 6 trains went into its annual refurbishment, the original Disney chassis were replaced and the car shells and hardware retained. The major difference with the new trains is that they are a molded block of steel with minimal welds and they are a lot heavier. So, while the conversion was going on, the Vekoma trains would have their back row condemned and harnesses locked in place so that that the weight of those trains matches the original ones. That is to avoid over speeding and blocking issues. On a funny note, one of the train’s had large 4 feet tall Mickey and Minnie Mouse plushes locked in so guests would not try sitting in those seats. We discovered on the web this promotional photo of the original Space Mountain: De la Terre a la Lune train. Notice the themed headrest, standard Vekoma shoulder restraints and the lack of air gates in the queue. Next, in 2000-2001, the park experimented with various solutions and you can see two of them in this picture. First, notice the headrest now is padded and covered in brown leather. The idea here is that the two soft rolls (made of compressed fabric and covered in leather as well) would absorb some of the side to side head movements. Second, the Vekoma harnesses received additional soft fabric padding that was held in place by the leather snap on wraps near the guest’s head. The soft roll solution was also tried in 2001 by Parc Asterix on the Goudurix. 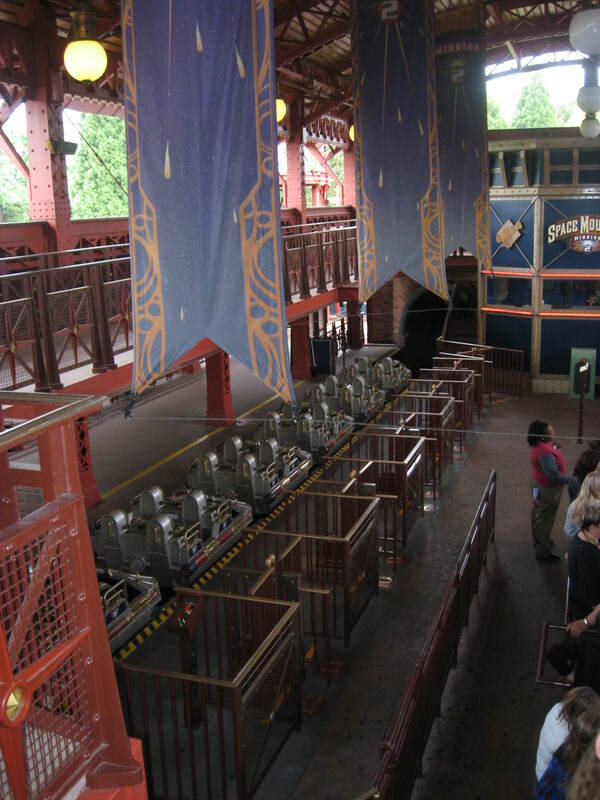 This picture was found on Lifthill.net, an amazing website that shut down a few years ago. After the Mission 2 transformation, the old car bodies were repainted and the safety system aligned with what present next door at Rock n Roller Coaster. The same foam headrests, padded shoulder restraints and sound system were retrofitted to the old seats. The launch catapult was sourced by Disney with Dassault Aviation assistance and they began with aircraft carriers electric plane catapults as a starting point. Two large electric motors were buried under a cement slab between the waiting line and station. Those two large motors are connected to flywheels and then a large drum located at the base of the cannon (the launch is housed inside a very elaborate cannon that has special effects). A large gauge steel cable run from the drum to the top of the cannon and then down to a pusher cart. That is where Vekoma got involved, as that cart run on a second set of track welded inside the main track that the trains run on. The launch is housed inside this large cannon. The silver trap door serves a dual purpose: in the ride storyline when it opens, it appears as if we are being loaded inside the cannon and then it closes down. Mechanically, in the summer, it provide extra air circulation for the ride’s electrical motors and flywheels. In the winter, the trap door effect is deactivated and kept closed so that the cold Paris air does not interfere with the launch mechanism. The launch cannon and the track leading to the mountain. The train briefly go outside before diving into space. Under the fourth car of the six cars train, a moving pivot is mounted and that is where the rubber nose of the pusher cart touches the train. Anti Rollback devices are mounted in the cannon and in order to make the launch as smooth as possible, they are spring loaded. They are A shaped and when the train is launched, they open to allow the train through without obstruction. When the train has to be held in place, the braking fins are pressed against the anti rollbacks. When the ride leave the station, it goes around a curve housed inside a metal tunnel and then it drops into the cannon. It is stopped by brakes and then, the pusher cart positions itself. Once it touches the pivot, the brakes open and the car goes up noisily as the train braking fins push against the anti rollbacks. Once it is ready to be launched, brakes and anti rollbacks open and the train is launched to 40 mph. The pusher cart then rolls back down to the next train. The pivot design allow it to behind it so it can place itself for the next launch. The ride was delivered with 6 trains and at any time, 5 trains will be present at the attraction with the 6th one undergoing its yearly rebuilt. To allow 5 trains operation, the ride was designed with a double station layout. At the entrance and exit of the station, there is a high speed rotating track switch that connects to the rest of the layout. There is a curved transfer track with space for two trains behind each station. What is absolutely amazing is that the ride does not need to be shut down to transfer trains on and off. The appropriate station has a “staging” mode that when selected, will rotate the track switch behind the station and open up the curtain that hides it. Then, a cast member will be able to move a train in or out using a console inside the staging (the name used at Disneyland Paris for ride vehicle storage areas). In total, the ride featured 9 blocks: side station, main station, bottom of cannon, top of cannon, zone 3 (top of the cannon to the brake zone), zone 4 (brake zone to bottom of B lift), zone 5 (top of lift B), zone 6 (drop out of the lift to the first brake zone) and finally zone 7 (buffer zone added between the zone 6 brake and the stations track switch). B lift use pairs of heavy duty pusher tires to smoothly take trains up the lift. Zone 3 and zone 6 braking zones have two different sets of brakes: 3 brakes on each are used for trimming and remain closed when the ride is in operation. Once the train has been slowed enough, they will open and allow the train to leave the braking area. Then, they close again for the next train. The rest are the safety brakes and they are open by default, closing when the next block is occupied or the ride has go down for a technical issue. When the ride is getting reset at opening or after a breakdown, the trim brakes are open and the safety brakes closed. Main station with a train parked in. When the ride opened, it did not have air gates for the next group of space travellers or dispatch enable buttons for the operators. Both were added in 2005. The blocking rules for this ride were are as followed: you cannot have two trains in zone 4 and 5 at the same time. The same rule also applies to zone 6 and 7. So, if you have a train stopped in zone 7, the train after will stop before cresting zone 5, which is the top of B lift. The train after that would stop in the zone 3 brake zone. If your back-up for some odd reasons ever prevent a train in zone 2 from launching, then the ride computer will automatically do an emergency stop. 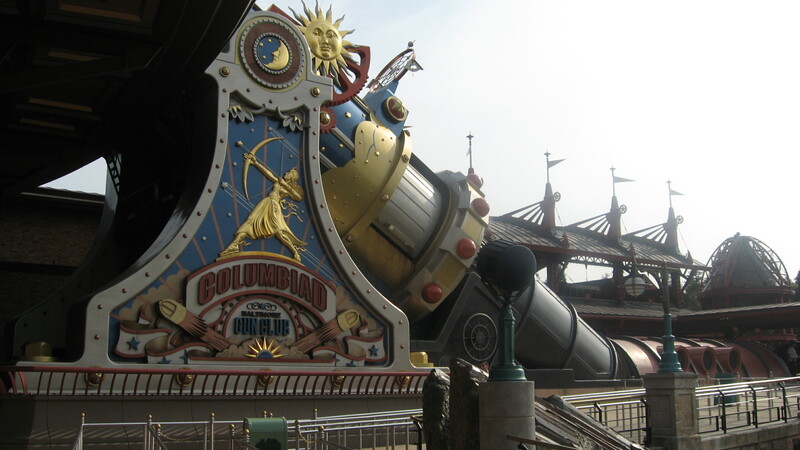 In 2005, Space Mountain ride system was modified with the second block in the cannon eliminated and trains now launching from the bottom of the cannon. It leads to a reduction in capacity, as you can now 4 trains on two stations or 2 trains on one station. Before, 5 trains on two stations or 3 trains on station was the standard. The capacity on 5 trains/two stations was a theoretical 2400 guests per hour with numbers of 2350-2375 reached in practice. 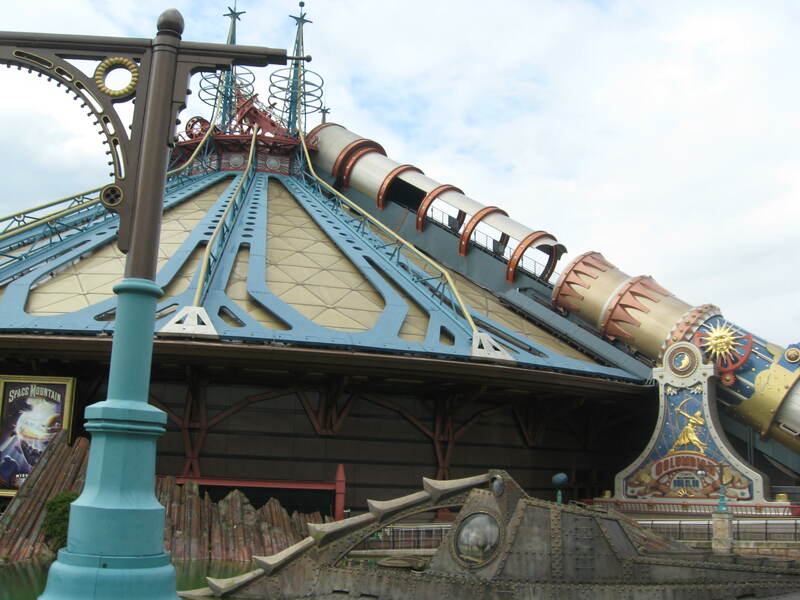 Starting in 2000-2001, Disneyland Paris started experimenting with the pneumatic pinch brakes on Space Mountain. The original Vekoma brakes are very efficient and never had a failure that causes collisions. But, in order to change the pads, you need to remove the whole caliper and then you have access to unbolt the pads to change them. So, to get around that difficulty, Disneyland Paris engineers designed a new pinch brake. It has the shape of a large split rectangle with an angled entry on the side that the car fin comes in. The long pads are replaced by bronze cassettes that can be unbolted with a ratchet without disassembling the whole thing. After trial and error, the right bronze mix was discovered and so, the 3 brakes in the main trimming section (at the end) of Space Mountain were replaced. It made maintenance a lot easier, as those are the brakes that see the most use, since they slow the train down when it comes into the brakes at 30+ mph. In this picture of the Barnstormer at the Magic Kingdom, you can see the same Cassette brakes that were installed at Space Mountain in Paris. Rock N Roller Coaster Paris eventually got those brakes in the final brake run and when the ride was converted to Eddy-Current magnetic brakes a few years ago, the Cassette brakes were transferred to Space Mountain. They were supposed to go up at the Zone 3 brake zone since the train is slowed there in order to take the next turn at a comfortable pace for riders. In 2017, the ride was shut down and is getting rebranded to Hyperspace Mountain, with a new Star Wars theme. As part of the transformation, a new fleet of Vekoma MK-1212 were customed designed and installed on the ride. A test with the Vekoma MK-1212 shell and restraint installed on an old chassis was conducted a few years ago and was quite successful. Using the MK-1212 cars mean the ride will be much more comfortable thanks to the soft shoulder restraints and the new colors are in blue to fit the new theme. This entry was posted in Coasters, Industry Profile and tagged de la terre a la lune, discovery mountain, Discoveryland, Disneyland Paris, Hyperspace Mountain, Mission 2, Space Mountain, Vekoma. Bookmark the permalink. ← Rafting in the Ozarks and Smoky Mountains: Part 11 of our look at River Rapids attractions.